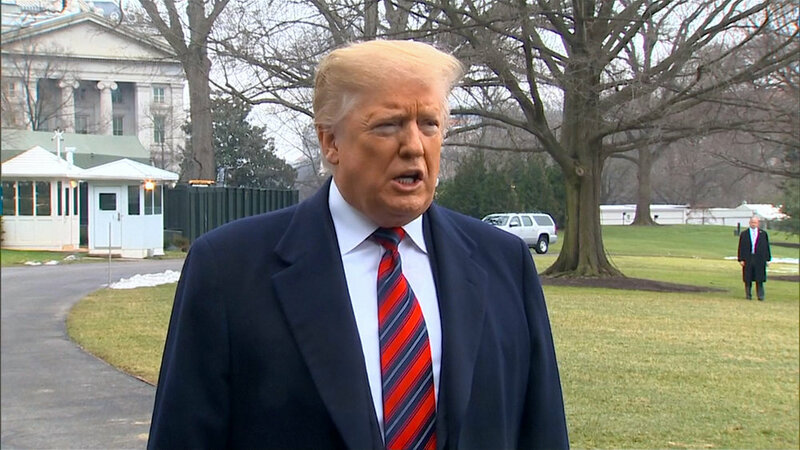 President Donald Trump said on Jan. 19 there has been progress toward a trade deal with China, but denied that he was considering lifting tariffs on Chinese imports. That follows lower-level negotiations held in Beijing earlier this month to resolve the bitter dispute between the world’s two largest economies by March 2, when the Trump administration is scheduled to increase tariffs on $200 billion worth of Chinese goods. According to sources briefed on the ongoing negotiations, cited exclusively by Reuters on Jan 18., the United States is pushing for regular reviews of China’s progress on pledged trade reforms as a condition for a trade deal—and could again resort to tariffs if it deems Beijing has violated the agreement. White House adviser Larry Kudlow also said on Jan. 18 that progress was being made on China trade talks. “We’re making progress in negotiating on the grandest scale between the two countries ever,” Kudlow said to reporters at the White House. According to Bloomberg, China has offered to go on a six-year buying spree to ramp up imports from the United States, by a combined value of more than $1 trillion. China would seek to reduce its trade surplus—which last year stood at $323 billion—to zero by 2024. U.S. markets rallied last Friday after the news of possible trade deal with China came out. The Dow jumped 336 points, or 1.3 percent, on Friday. The S&P 500 climbed 1.3 percent, while the Nasdaq advanced 1 percent. All three major indexes surged nearly 3 percent on the week. After the first round of trade talks between the United States and China this year, The Epoch Times has reported that Beijing has showed signs of willingness to make concessions due to its worsening economic conditions. Recent economic indicators continue to show bad signs. Analysts are predicting that China’s 2018 GDP will hit a 28-year low. A 5 minute video of an internal meeting of high-ranking Chinese officials in Liaoning Province was leaked and widely circulated on the internet recently. In this video, Wang Baosheng, member of the Political Consultative Conference of Shenyang City, said, “Right now the entire economy is going down. Desperate wails can be heard everywhere in all industries. At a meeting of the State Council of China on Jan. 14, Chinese Premier Li Keqiang admitted that pressure from the economic downturn was mounting, and said that China needed to bear up against the pressure. With the economic downturn, new waves of unemployment are hitting the job market. Recently Apple’s biggest iPhone assembler, Foxconn Technology Group, let go around 50,000 contract workers in Zhengzhou City in east-central China. Chinese e-commerce giant Alibaba has postponed its recruitment program. Gavekal Dragonomics’ China Consumer Analyst Ernan Cui pointed out in a Jan. 9 report that an official survey covering 374,000 large industrial firms shows total employment declined by about 2.8 million people in the 12 months through November.